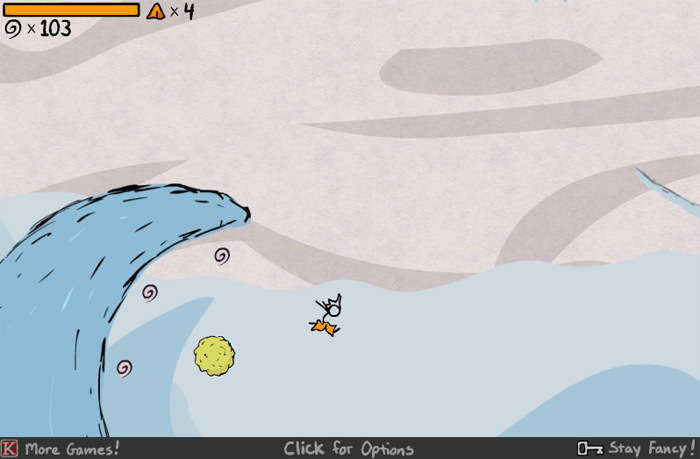 Fancy Pants Man is a fun and exciting game based around the misadventures of …. Fancy Pants Man. The game requires a high amount of skill and reflexes, but once mastered, is a truly rewarding experience. 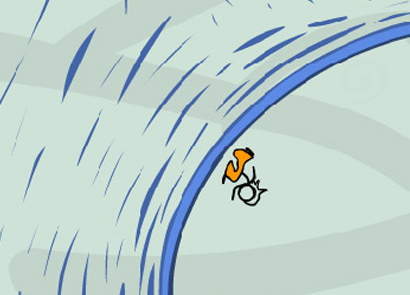 The game allows the user to run, jump, and spring their way through levels of various difficulty and complexity. 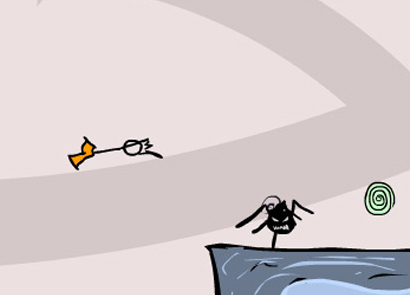 This lovely game feels like it is straight out of someone’s imagination, you control a stick figure through intriguing and complex worlds hoping to make it to the finish. 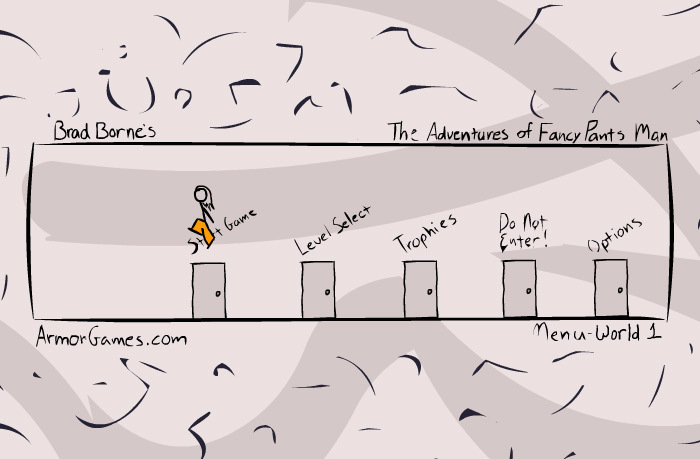 Fancy Pants Man is a platformer by heart. It combines side-scrolling action with vertical elements. Like Mario and Sonic, you have a currency to collect as you run through levels. However, instead of collecting coins or rings, you collect squiggly lines that serve as your scoring mechanism for the game. This gamestlye gets addictive as you unlock powerups and skills to help you in your platforming endeavors. Each level of this game had new challenges and enemies to face, so it is vital to stay on you are A-Game while going through the increasingly difficult levels. The main form of scoring while playing Fancy Pants Man is the collection of the squiggly lines that I mentioned earlier. These squiggles are incredibly important to collect if you wish to score better than your friends or family do. 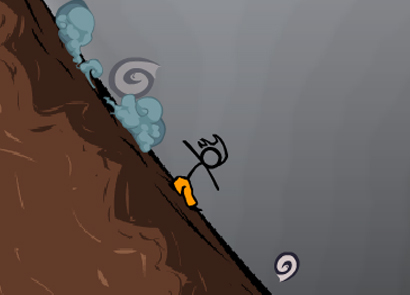 By collecting the squiggles and aiming for better scores, you can become an excellent Fancy Pants Man player! The game encourages competition by keeping score; you can capture some of the magic of aiming for better scores in old Super Mario Bros. games by doing so in Fancy Pants Man. During my time playing it, I’ve developed a couple of tips that could be incredibly useful to new players. 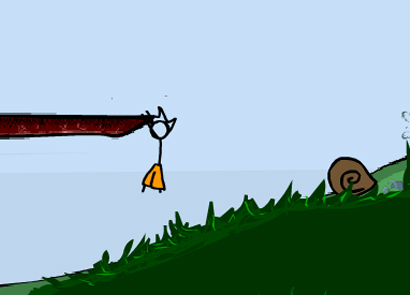 First, I find exploration to be incredibly important in Fancy Pants Man. I cannot tell you how many times while playing this game I found hidden areas or items. Therefore, it is incredibly important to be as thorough as possible while playing. Search every nook and cranny you feel that you need to and you will find some great success. I think it is beneficial to search as many areas as you never know what you may find. In addition, I also found it important to use time jumps properly and utilize the roll. If you do both of these things, you’ll be able to access more areas more easily than just randomly pressing the jump button or forgetting about the roll function. 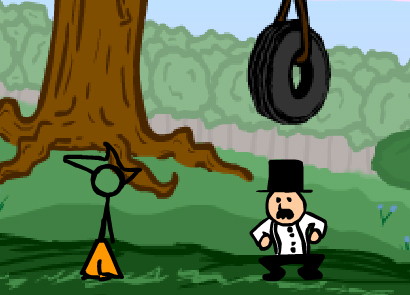 Fancy Pants Man is a game aimed at providing innocent, enjoyable fun. Even so, I think it is important that parents try the game first before they let their children play. There is nothing in this game inherently inappropriate, but it is very beneficial for parents and children to enjoy online content together. That way, parents can feel safe in their children’s online activity. Fancy Pants Adventure is a trademark owned by Brad Borne. This website is not endorsed by or affiliated with Brad Borne in any way.